Restrictions in the Eighteenth Century. Right to Trade in Grain Forfeited. Town in the province of Westphalia, Prussia. The presence of Jews there is first mentioned in 1606, when the diet of Paderborn decided to prevent any increase of the Jewish inhabitants on account of the exorbitant interest exacted by those of them engaged in money-lending. On Feb. 23, 1607, the prince bishop Theodor von Fürstenberg promised the diet to do his best to comply with its wishes; and he issued to the Jews of the locality the following directions: They were not to charge a higher rate of interest than one schwanenheller per week on every thaler; once in every year they were absolutely obliged to settle in full with their debtors; every obligation of a debt was to be approved by the authorities; pledges obtained from Christians and not redeemed within the prescribed time might be sold only in accordance with an official valuation; Jews might no longer lend money on real estate; claims of every kind whatever would not, under any consideration, be valid for more than two years. Jews were permitted to deal only in gold, silver, gilded goblets, rings, and precious stones. When Duke Christian of Brunswick in 1621 passed through Westphalia, levying war contributions, the Jews of Paderborn were compelled to pay the sum of 30,000 thaler. The expulsion of the Jews and their absolute exclusion from trade were again sought in 1651; but the request was not complied with. The decree regulating their position, promulgated at the end of the seventeenth century by Bishop Hermann Werner von Metternich, continued in force until the foundation of the kingdom of Westphalia under Jerome, brother of Napoleon I. A supplementary edict of the elector Clemens August on their legal condition was proclaimed Feb. 3, 1718 (or 1719). No Jew was allowed to marry without the permission of the sovereign; and the maximum number of Jewish families in Paderborn was fixed at 125. The excess of young persons was compelled to emigrate. Nevertheless there were at times more than 200 Jewish families in Paderborn. The Jews were under the protection of the bishop; and it was his personal right to investigate every year most minutely the domestic affairs of every Jewish family. No Jew could be admitted as a resident unless he possessed a letter of safe-conduct from the sovereign. To obtain this it was necessary to produce evidence of the possession of at least 1,000 thaler as well as a testimonial of good behavior. The applicant was then obliged to take an oath that he would be true to the bishop, and would not undertake anything that might be detrimental to the interests of the cathedral chapter. After these formalities had been complied with he became a "vergleiteter Jude." Foreign Jews were not permitted to stay in the locality longer than three days. They were not obliged to pay any fees; but the resident Jewswere compelled to pay an assessment of 25 thaler yearly for them. In Rietberg, a county near Paderborn, a bearded Jew was obliged to pay a poll-tax of 12 groschen; a beardless one, a tax of 6 groschen only. The Jews of Paderborn were privileged to hold divine service, and to build synagogues; but neither the latter nor Jewish dwellings were permitted in the neighborhood of a church. 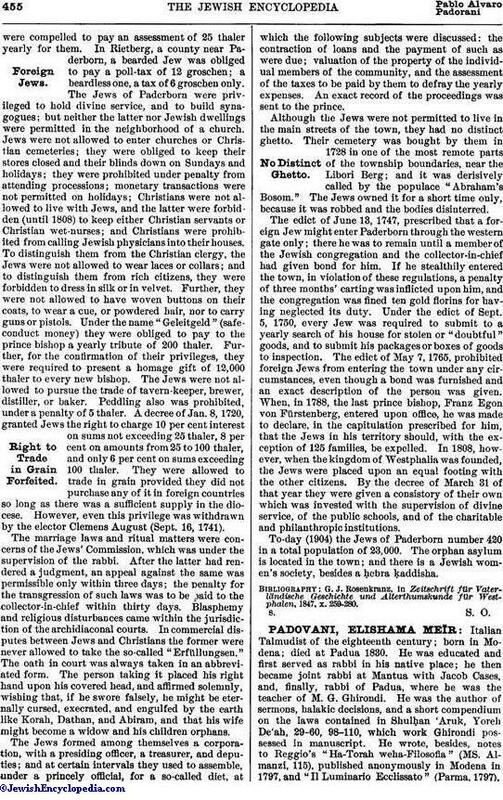 Jews were not allowed to enter churches or Christian cemeteries; they were obliged to keep their stores closed and their blinds down on Sundays and holidays; they were prohibited under penalty from attending processions; monetary transactions were not permitted on holidays; Christians were not allowed to live with Jews, and the latter were forbidden (until 1808) to keep either Christian servants or Christian wet-nurses; and Christians were prohibited from calling Jewish physicians into their houses. To distinguish them from the Christian clergy, the Jews were not allowed to wear laces or collars; and to distinguish them from rich citizens, they were forbidden to dress in silk or in velvet. Further, they were not allowed to have woven buttons on their coats, to wear a cue, or powdered hair, nor to carry guns or pistols. Under the name "Geleitgeld" (safe-conduct money) they were obliged to pay to the prince bishop a yearly tribute of 200 thaler. Further, for the confirmation of their privileges, they were required to present a homage gift of 12,000 thaler to every new bishop. The Jews were not allowed to pursue the trade of tavern-keeper, brewer, distiller, or baker. Peddling also was prohibited, under a penalty of 5 thaler. A decree of Jan. 8, 1720, granted Jews the right to charge 10 per cent interest on sums not exceeding 25 thaler, 8 per cent on amounts from 25 to 100 thaler, and only 6 per cent on sums exceeding 100 thaler. They were allowed to trade in grain provided they did not purchase any of it in foreign countries so long as there was a sufficient supply in the diocese. However, even this privilege was withdrawn by the elector Clemens August (Sept. 16, 1741). The marriage laws and ritual matters were concerns of the Jews' Commission, which was under the supervision of the rabbi. After the latter had rendered a judgment, an appeal against the same was permissible only within three days; the penalty for the transgression of such laws was to be paid to the collector-in-chief within thirty days. Blasphemy and religious disturbances came within the jurisdiction of the archidiaconal courts. In commercial disputes between Jews and Christians the former were never allowed to take the so-called "Erfüllungsen." The oath in court was always taken in an abbreviated form. The person taking it placed his right hand upon his covered head, and affirmed solemnly, wishing that, if he swore falsely, he might be eternally cursed, execrated, and engulfed by the earth like Korah, Dathan, and Abiram, and that his wife might become a widow and his children orphans. The Jews formed among themselves a corporation, with a presiding officer, a treasurer, and deputies; and at certain intervals they used to assemble, under a princely official, for a so-called diet, at which the following subjects were discussed: the contraction of loans and the payment of such as were due; valuation of the property of the individual members of the community, and the assessment of the taxes to be paid by them to defray the yearly expenses. An exact record of the proceedings was sent to the prince. Although the Jews were not permitted to live in the main streets of the town, they had no distinct ghetto. Their cemetery was bought by them in 1728 in one of the most remote parts of the township boundaries, near the Libori Berg; and it was derisively called by the populace "Abraham's Bosom." The Jews owned it for a short time only, because it was robbed and the bodies disinterred. The edict of June 13, 1747, prescribed that a foreign Jew might enter Paderborn through the western gate only; there he was to remain until a member of the Jewish congregation and the collector-in-chief had given bond for him. If he stealthily entered the town, in violation of these regulations, a penalty of three months' carting was inflicted upon him, and the congregation was fined ten gold florins for having neglected its duty. Under the edict of Sept. 5, 1750, every Jew was required to submit to a yearly search of his house for stolen or "doubtful" goods, and to submit his packages or boxes of goods to inspection. The edict of May 7, 1765, prohibited foreign Jews from entering the town under any circumstances, even though a bond was furnished and an exact description of the person was given. When, in 1788, the last prince bishop, Franz Egon von Fürstenberg, entered upon office, he was made to declare, in the capitulation prescribed for him, that the Jews in his territory should, with the exception of 125 families, be expelled. In 1808, however, when the kingdom of Westphalia was founded, the Jews were placed upon an equal footing with the other citizens. By the decree of March 31 of that year they were given a consistory of their own which was invested with the supervision of divine service, of the public schools, and of the charitable and philanthropic institutions. 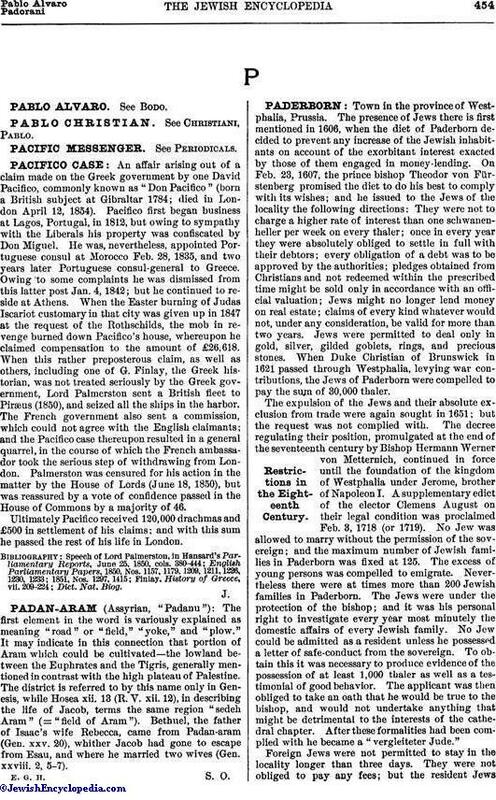 To-day (1904) the Jews of Paderborn number 420 in a total population of 23,000. The orphan asylum is located in the town; and there is a Jewish women's society, besides a ḥebra ḳaddisha. G. J. Rosenkranz, in Zeitschrift für Vaterländische Geschichte und Alterthumskunde für Westphalen, 1847, x. 259-280.